We’d love your help. 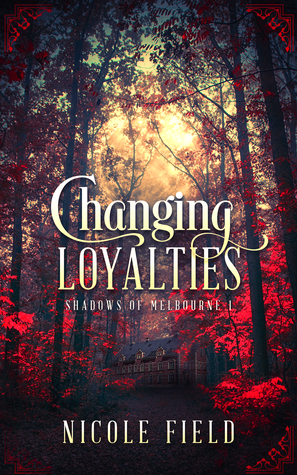 Let us know what’s wrong with this preview of Changing Loyalties by Nicole Field. When Dahlia finds the body of her father, a werewolf brutally murdered and left to die alone, she's left with more questions and grief than answers. But who or what killed him remains unknown, and it soon becomes clear her father isn't the killer's only target. Adding to the growing pile of mysteries in her life is the new job—for a company that seems to be run by the kind When Dahlia finds the body of her father, a werewolf brutally murdered and left to die alone, she's left with more questions and grief than answers. But who or what killed him remains unknown, and it soon becomes clear her father isn't the killer's only target. To ask other readers questions about Changing Loyalties, please sign up. 2.5 Stars. Unfortunately, this was not my cup of tea. I love paranormal books, and try to read just about any lesfic paranormal book I can get my hands on. Vamps, werewolves, this should have been right up my alley but I just could not connect with it. This is the 2018 version released by LT3 Press, I am not sure how much this story has changed since when it used to be called Gothic. Dahlia is in her early 20’s and is a student in University in Australia. What is different about Dahlia is that he 2.5 Stars. Unfortunately, this was not my cup of tea. I love paranormal books, and try to read just about any lesfic paranormal book I can get my hands on. Vamps, werewolves, this should have been right up my alley but I just could not connect with it. This is the 2018 version released by LT3 Press, I am not sure how much this story has changed since when it used to be called Gothic. Dahlia is in her early 20’s and is a student in University in Australia. What is different about Dahlia is that her father was a werewolf and she was raised by her godmother a vampire. Even with supernatural beings all around her, Dahlia is trying to live a normal life. But when her father is murdered, her life will never be the same. I really struggled with this book. I almost DNF’d it at least twice, but since this was an ARC, I kept on reading. I did not care for the writing style. It was way too much “tell” not “show” and because of that I never really connected to any characters. In reading this I was actually surprised this had an LGBT label. It was not making sense to me as the first half is basically just a bunch of guys drooling over Dahlia. It was not even until after the 50% mark Dahlia announces she is poly and then she is suddenly attracted to a character that is a woman. And I mean suddenly as it seemed in the whole first half that she didn’t even like the woman. And now out of the blue she decided the woman was attractive and would date her. It honestly killed the chemistry because of it. Now I will admit the second half of the book was a lot better than the first. The writing improved some, and the story was just more interesting. I would say first half 2 stars, second half 3 stars. I still don’t think it was enough to really save the book so that I would read a sequel if there is one. I can’t recommend this one, but it might appeal to some New Adult paranormal fans. There’s nothing worse than being told how special and talented a character is, without ever seeing the proof for yourself. In CHANGING LOYALTIES, Dahlia has always been the dividing line between the werewolf and vampire factions. CHANGING LOYALTIES is part murder mystery, part paranormal romance. However, it’s almost immediately clear who the murderer is and who the end love interest is. There’s a lot of potential in a polyamorous, goth main character, Review courtesy of All Things Urban Fantasy. There’s a lot of potential in a polyamorous, goth main character, but the novel never makes Dahlia fun. Part of the problem is that there’s too much telling and next to no showing. The best writing is when Dahlia is grieving the father that abandoned her, but there’s not enough examination into the conflicting emotions of that relationship. Even Dahlia’s strained relationship with her mom, who she only ever calls Meredith, is smoothed over by the end of the book. Every complicated emotion is waterdowned down, from Dahlia’s mixed feelings about Elliott to her flirtation with her boss. CHANGING LOYALTIES also has too many characters that are introduced to pad out a scene. These characters are only there to take up space. For example, Renee is Dahlia’s best friend, who knows nothing about the supernatural worlds, and exists only to drag Dahlia to clubs and offer a place to live. There’s also the introduction of the Sisterhood, an ominous third party that employs Dahlia. The Sisterhood know all about the supernatural world, something Dahlia never reports to either the werewolves or the vampires. There’s a lot of table setting in CHANGING LOYALTIES, but there’s no emotional pay off. Also, although I usually ignore copyediting problems, there were several times descriptions and important information changed. In one paragraph a character has black hair, in the next she has purple. Or a killer is definitely non human, then a character confirms that ‘yes, the killer is definitely human’. Even if you’re interested in an urban fantasy with a poly or bisexual main character, there are better books to read. There are plans for re-inventing and publishing Gothic as Changing Loyalties with Less Than Three Press in 2018. Preorder information available here. Can I start with how beautiful the cover is? Honestly, I feel like this book had a lot of good ideas, but many of them weren't executed too well. I loved the main character being a human who is adopted by both werewolves and vampires, and I absolutely loved the vampire godmother who keeps food around just for her! Still, other than Al and Luca, I didn't really get a family-feeling from the werewolf pack at all, and I was really I received a copy through NetGalley in exchange for an honest review. I loved the main character being a human who is adopted by both werewolves and vampires, and I absolutely loved the vampire godmother who keeps food around just for her! Still, other than Al and Luca, I didn't really get a family-feeling from the werewolf pack at all, and I was really sad that there weren't any female werewolves important to the story, or at least Dahlia's age. I loved that there was a polyamorous character, but I didn't really feel the chemistry with one of the love interests, and I feel like we didn't spend much time with the other one. I absolutely did /not/ love the kind of commitments Dahlia made without asking or even telling any of her family about it, but I suppose that's what the title referred to? I feel like the book could have used more editing - there were some contradictions that made no sense and I can only guess that they were typos (e.g. Al's name instead of William's, or a "not" missing from the sentence and making Dahlia contradict herself in the same paragraph). I would have loved to spend more time with certain characters, and it felt a little rushed when Dahlia started suspecting the murderer out of nowhere and got kidnapped immediately after. Recommends it for: Anyone who enjoys a good young adult book, vampires, werewolves, or anything supernatural! "The story is well written, and once you get past the introduction, it’s a very gripping read. I read it all in one sitting because I couldn’t put it down. [The end of the book and the] last chapter seems like an afterthought that’s a bit hard to follow. I’m really looking forward to the sequel to this book; I need more of this story! I simply must know what happens next. Dahlia is ready to embrace university life. After growing up with her vampire godmother Annabelle and a werewolf foster dad and brother, Dahlia is ready to enjoy life without the paranormal. In one of her classes she meets Elliot who is not only a friend of her godmother’s but is a vampire as well. Then tragedy strikes again and the werewolf father she hadn’t seen since her mother’s funeral is killed. Now her mother is back as a ghost and she finds out that the werewolves are being targeted. Unf Dahlia is ready to embrace university life. After growing up with her vampire godmother Annabelle and a werewolf foster dad and brother, Dahlia is ready to enjoy life without the paranormal. In one of her classes she meets Elliot who is not only a friend of her godmother’s but is a vampire as well. Then tragedy strikes again and the werewolf father she hadn’t seen since her mother’s funeral is killed. Now her mother is back as a ghost and she finds out that the werewolves are being targeted. Unfortunately for me the plot and the flow of Gothic felt really choppy. I would go from an interesting story line one minute to being bored and back again all throughout this book. It just seemed to take a long time to read this kind of short story because of that. While the writing style may not have been for me I do think if you are into New Adult Paranormal books then you should give this one a try. Dahlia walks a fine line between the vampire who raised her and the wolves of her heritage. An attempt to live in the human world fails when her life careens out of control, and she must change her thinking. In a world where vampires and wolves live, only the strong survive. Dahlia must make her own way after having lived only on the fringe. The ties between supernatural beings have always been there, if not visible. Now someone would like to draw the line and separate the species. The next genera Dahlia walks a fine line between the vampire who raised her and the wolves of her heritage. An attempt to live in the human world fails when her life careens out of control, and she must change her thinking. The ties between supernatural beings have always been there, if not visible. Now someone would like to draw the line and separate the species. The next generation must learn lessons learned in the past or risk losing it all. Vampires, wolves and ghosts...oh my. Ms. Fergusson tells an emotional tale of one human girl's experiences fitting into the world of super naturals. The story was interesting but I was left feeling as if I was missing something. I warn readers with such an abrupt ending it is inevitable you will be left looking for a sequel in the future.